This is a wild lily that popped up out of nowhere. It hasn't been there in previous years, and we have nothing similar in color on our property. I have seen other wild lilies here in Oklahoma that are orange with brown spots and seem to have the same shape. I'm curious to know how a lily shows up in a place it's never been before - can anyone tell me? I know about naturalization, but there are absolutely no other plants of this type in this area. I thought perhaps an animal such as a gopher, etc., may have dropped or buried a piece of the tuber or root system and that's how it ended up in this new location? I'd love to hear any ideas you'd be willing to share! Did the flower come up and bloom before any of the leaves appeared? 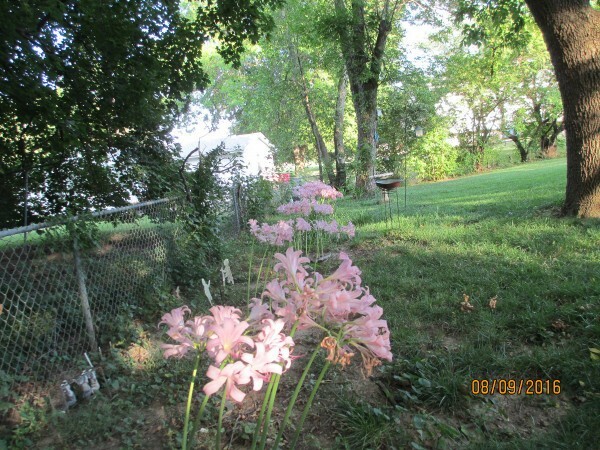 I'm thinking your "wild lily' could be Lycoris. Some lycoris have long tendril-like structures as part of their flower, while other lycoris look more like your flower or a day lily. 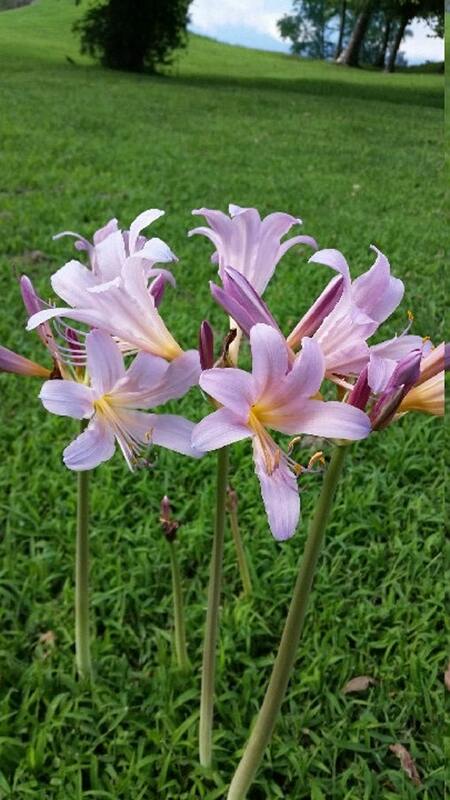 I had a lycoris bulb stay dormant, deep in the ground for seventeen years. I forgot about it. I was digging a hole and discovered it. The bulb was extremely healthy. Wow! That's beautiful! Mine popped up under a tree, unfortunately I didn't notice it until the flowers caught my eye. It's in an area that doesn't get mowed & is cramped between out- buildings. Thank you for your help!! First they start out as all blade shaped leaves and once the leaves fade up pops just the lily with no leaves, also known as Naked Ladies. 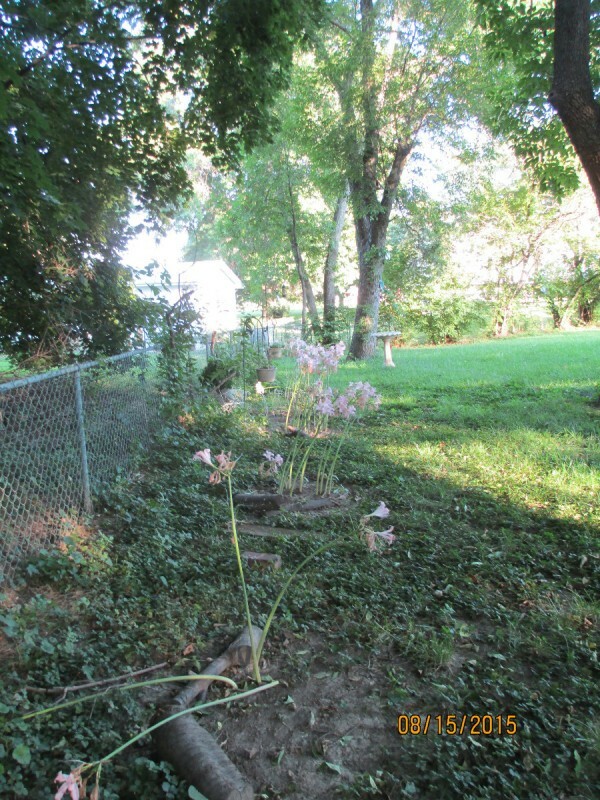 When there was big mass of leaves my hubby use to mow right over them, and in late August they would all bloom beautifully. 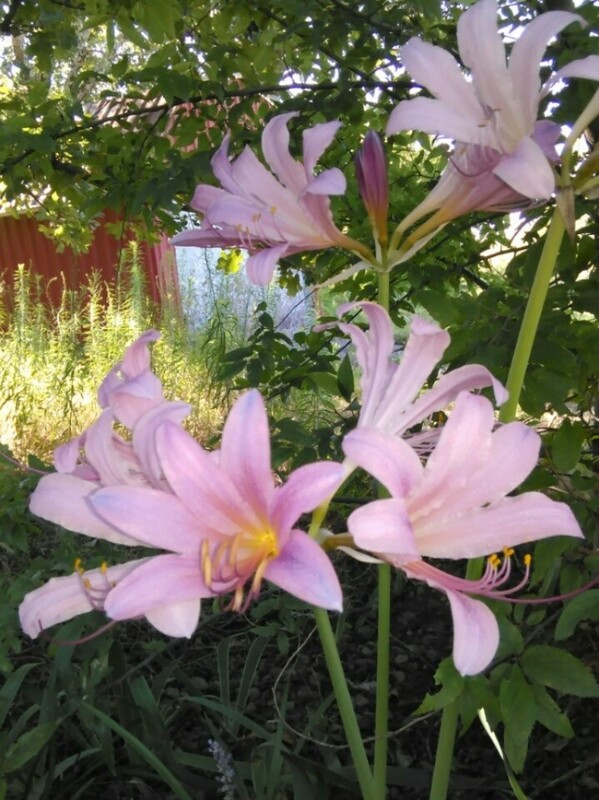 These are Surprise Lilies also known as Naked Ladies. The leaves come up in the spring. Then they die down. I towards Fall. (usually in September but this year they started comin up the end of July here.) then the stem pops up with the flowers. no other leaves. They come up from the bulb which is very large like from the size of a baseball to a soft ball size. But they also spread from wind born seeds. Thank you very much for sharing this information with me! I really appreciate you taking the time to let me know and giving me the details! Thanks again! A WONNERFUL find!!! We have lillies just like this in Rock Cut State Park, Illinois. I don't believe anyone planted them there. Will have to pay more attention to them. I MIGHT even try to dig up a bulb if no park rangers are lookin'!!! They should be propogated to keep their beauty alive for ALL to enjoy! What a great blessing these flowers are. I am sure your lily is Lycoris. There are many varieties of Lycoris. Yours would be Lycoris squamigera. One of it's common names is Resurrection Lily, because the leaves die down in late Spring and then in Fall a single stalk for each flower shoots straight up out of the ground. The plant is in the Amaryllis family and is native to Japan.